ERROL MORRIS IS FASCINATED by the unreliability of images, memories, and the symbiotic, if often deceptive, relationship between them. It seemed fitting, then, that his mere appearance at the New York Public Library last Wednesday night served (for me) as an object lesson in one of his obsessions. While I had been aware of Morris and his remarkable, idiosyncratic documentaries since at least The Thin Blue Line (1988), I’d somehow gotten it into my head that he looked like the subject of his 1999 documentary Mr. Death: The Rise and Fall of Fred A. Leuchter, Jr. (the titular Mr. Leuchter—bespectacled, physically slight, classically nerdy—appears on the movie’s poster). 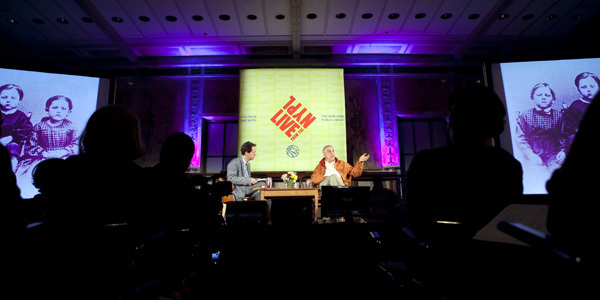 When Morris took the stage with Live at the NYPL director Paul Holdengraber, I was to my surprise confronted with a large man with white hair who resembled a friendlier Ariel Sharon. The occasion was the publication of Morris’s book of illustrated essays on photography and epistemology titled Believing Is Seeing: Observations on the Mysteries of Photography, and my memory’s false substitution of Leuchter for Morris would have made a perfect footnote to his argument. Morris’s lifelong project as a documentarian, and this book in particular, can be seen as a perversion of the famous anti-dictum—attributed to the eleventh-century Persian Hashishin (or Assassins), beloved of Nietzsche and William S. Burroughs—“Nothing is true; everything is permitted.” For Morris, it is more like: Something is true; everything is permitted (in the quest to find it). The latter clause has a personal edge for the filmmaker: The Thin Blue Line was showered with awards and praise in the year of its release, yet denied admission to the documentary category of the Oscars because of a prohibition against reenactments. Never mind that the arty, multiple-perspective restagings (of a roadside murder of a highway patrolman) involved a Burger King milkshake cascading through the air in slow motion as a Philip Glass score pulsed with inexorable circularity on the sound track; Forensic Files, it wasn’t. Cinema verité, once the province of intellectualized, ideologically motivated filmmakers, had become mainstream Hollywood dogma, and Morris wasn’t following the rules. Since then, both documentary filmmakers and the Academy Awards have fallen under the sway of his influence (he finally won an Oscar in 2003 for The Fog of War: Eleven Lessons from the Life of Robert S. McNamara). The superficial aspects of his style are, like Bob Dylan’s, easy to parody, yet remain strangely compelling.